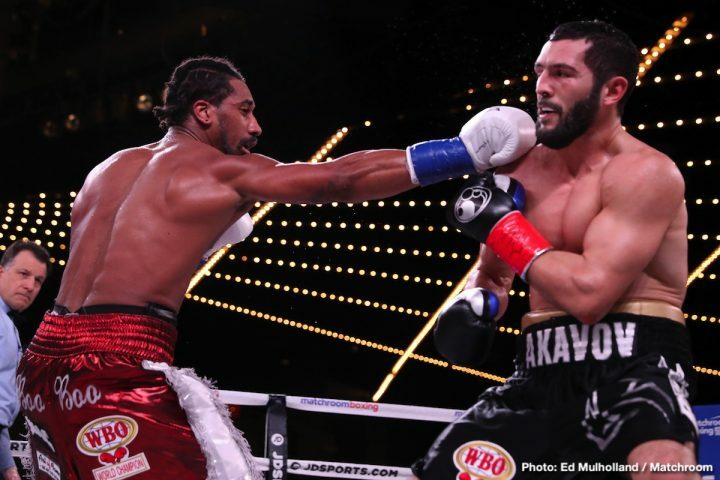 By Mike Smith: Demetrius Andrade will be defending his WBO middleweight title on June 22 or 29, but it won’t be against #6 WBO Maciej Sulecki, as previously hoped. According to ESPN, Sulecki (28-1, 11 KOs) has a hairline fracture of his right hand from his recent 10 round unanimous decision win over Gabriel Rosado, so he’s out of the picture for the next opponent for Andrade. This would have been an interesting fight if Sulecki had challenged Andrade. Andrade’s promoter Eddie Hearn of Matchroom Boxing says he’s still going to be fighting in June on one of the two dates, 22nd or 29th, in his hometown of in Providence, Rhode Island. This will be the second title defense for the 2012 U.S Olympian Andrade of his World Boxing Organization middleweight belt that he captured last October with a 12 round unanimous decision win over Walter Kautondokwa. In Andrade’s first defense of his WBO 160 lb title, he defeated an over-matched Artur Akavov by a 12th round knockout on January 18, at Madison Square Garden in New York. Akavov looked poor, and it was a disappointing fight. The boxing public wants to see Andrade defend his WBO title against former middleweight champion Gennady Golovkin on DAZN. Now that Triple G has signed with DAZN, he’s an option for Andrade. However, GGG has been mentioned as likely facing Hassan N’Dam in his next fight in June. Although Andrade may eventually get a fight against Golovkin at some point, it’s not likely to happen for his next title defense in June. If this is another mediocre opponent for Andrade to defend against, DAZN won’t be getting much value for their money in having him fight on their streaming platform. Andrade’s last two opponents have been woeful. Andrade has had some bad luck. He was signed to fight Billy Joe Saunders last October, but the British fighter tested positive for a banned substance and couldn’t get his boxing license. If Saunders and Andrade had fought each other, they might be fighting again by now. Andrade wants to be able to fight guys like Golovkin and Saul Canelo Alvarez, but with the way he’s being matched against continually lesser opposition, it’s nearly impossible for him to increase his popularity enough for him to be seen as a viable option for those two talented middleweights.